Formed in 1907 from the eastern part of San Diego County, Imperial is the youngest of California's 58 counties. 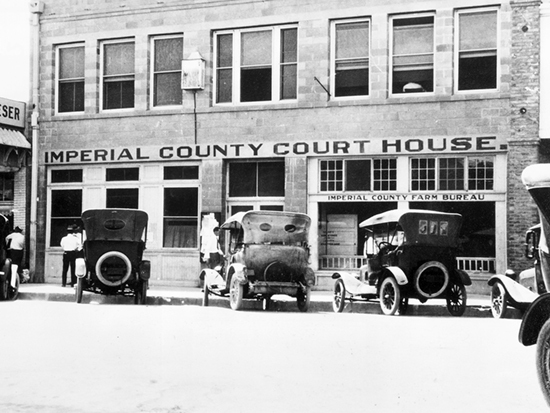 Despite claims by government surveyors that the surrounding desert "was so desolate, barren, and hot that human habitation would never be possible within its confines," Imperial County residents in the 1920s pressed on in establishing a county government. The courts occupied these offices on the second floor of a bank building until 1924, when the county built a new courthouse on donated land in El Centro. The county, which has since grown into one of the state's richest agricultural regions, still occupies the El Centro building.